“The Book of Mormon,” the crude yet sidesplitting musical scored big at the 65th Annual Tony Awards, winning four technical awards, best score, best featured actress, and best direction. Other big winners included the technically astounding, emotionally draining “War Horse” for best play and “The Normal Heart” for best play revival. Neil Patrick Harris, no stranger to Broadway, led the evening’s festivities with an opening number singing, “Broadway has never been broader/It’s not just for gays anymore!” He later had a "charm-off" with a fellow and former Tonys host, Hugh Jackman. The duo's face-off was chock full of familiar Broadway melodies ("Don't Rian on My Parade," "Anything You Can Do (I Can Do Better)," "Make 'Em Laugh,"as they tried to one-up eachother on credentials, including a slight to Jackman's short-lived musical gambling, "Viva Laughlin," and NPH's "How I Met Your Mother." The Beacon Theater, the surrogate Radio City Music Hall, was jam-packed with celebrities, ranging from Hollywood staples to Broadway legends. In the opening number, NPH commented how “hot” the 85-year-old Angela Lansbury looked, as well as supermodels Christy Brinkley and Brook Shields. Shields had a difficult time coming in on a vamped musical number, first having NPH count off her entrance—twice!—before the 46-year-old finally made a grab at her notes. 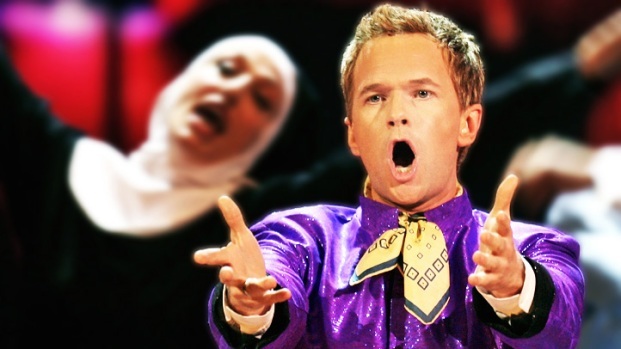 NPH also took the opportunity to make six jokes about the ailing “Spider Man: Turn Off the Dark” musical. The opening’s been postponed several times due to cast injuries and technical malfunctions. Bono and The Edge took the stage at one point to joke about the many delays. The two thanked the cast and crew for their “patience,” then introducing a number from the show where Peter Parker and Mary Jane Watson on a dizzyingly high fire escape singing a ballad to each other. Other celebs in attendance included Al Pachino, Kelsey Grammer, “Company” revival alums Jon Cryer and Stephen Colbert, Vanessa Redgrave, and Edie Falco. Daniel Radcliffe, who stars in “How To Succeed in Business Without Really Trying” wasn’t up for any awards (though co-star John Larroquette, who won best featured actor in a musical, thanked Radcliffe for giving him a job saying without him, he’d be “home, sitting in my underwear, watching this on television”) but took the stage anyways. The “Harry Potter” star proved he could play more than a boy wizard by singing and dancing in a challenging number from the musical. One thing is for certain—it’ll be impossible to get tickets to “The Book of Mormon” for a long time to come.